I realize that I am not posting often enough to my blog, but is there really a rule or protocol to follow for this 'blogging' thing we do? Well, I have not been just sitting here looking at other people's blogs though I have to admit that I do scour quite a few daily. I always get inspired by the creativity on the blogs I frequent and though I think I am quite creative sometimes I really need the inspiration of others. I have one bag done and more little bags to add to it. 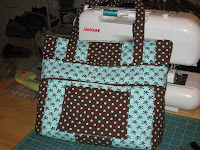 I also cut out another bag that I have yet to sew. There are so many projects in the planning process some are just stuck in my head and some I have put down on paper. I get this way every year at this time and I really wish for once that I would actually be realistic and just plan projects that I could really finish by Christmas, but where would the challenge be in that? We did a little spring cleaning and furniture moving yesterday because of a few pieces that we rescued from going to the dumpster at work. It was fun really and feels really great to have things more in order in this tiny apartment we call 'home'. 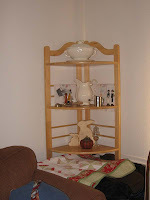 The corner shelf found a corner and some fun things that had been sitting around are now showing off quite nicely on it. 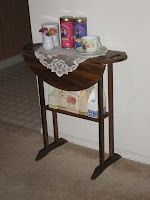 The little drop leaf table is keeping some of my favorites teas close by so I can quickly prepare a cup of soothing tea if anything gets too stressful when I am sewing or cooking. 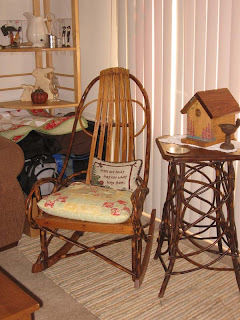 Most important is that my Grandmothers bentwood rocker and bentwood table are now sitting side by side just as they should be. Now it is feeling homey again! I have some fun projects for myself that can wait till after Christmas that I am really excited about. I found the cutest quilted wall hanging at a shop in Los Gatos. Theyclerk said that they had sold all the patterns at a quilt show so I kept checking back and finally got lucky enough to get one and picked up some really cute fabrics to work with it. 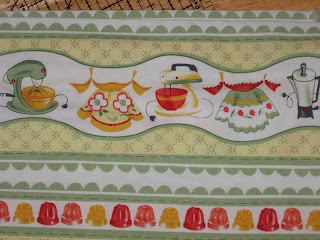 Some of the fabrics are from a Michael Miller line with old fashioned mixers and kitchen stuff and lots of Jello! The fabric is called 'Mix and Perk'. 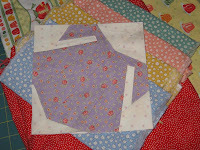 The pattern is paper pieced little apron blocks. 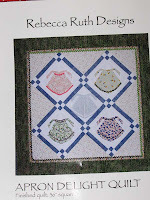 I am going to use some 50's repro fabrics for the aprons by Rebecca Ruth Designs. I am making it a lot like the one in the store with a few changes of my own. I don't really have the wall space to hang this so it might be used on my table from time to time. I just love it so I will find a place for it somewhere! I have a busy day off planned tomorrow going to quilt store sale and shopping for party dresses with my sister. Probably not much sewing time...making the time has been the most difficult part for me along with making sure that I have ALL the supplies to complete a project. I am always missing a key ingredient like a zipper...dah! I always want to ask people with all the great things on Etsy "How do they do that?" Meanwhile I will just keep working on my WIPs and hopefully not add many more then maybe, just maybe I will post about some completed projects. That will feel as good as the spring cleaning I just did (finally! ).